Many people, it would seem, decide to downshift by moving house. More specifically, to the country. This may be to find somewhere in a less expensive area, perhaps somewhere bigger/smaller or with more land. Or for a change of scene. For us that was never really a consideration. We bought our big, Victorian terrace house very cheaply, before prices began to rise here, and although there has been a big jump in the cost of local property since, it is still some of the cheapest in the country. According to Country Homes and Interiors magazine, (September 2007), "Lincolnshire......Is the only county in the UK with an average price for a detached family house below £200,000." The size of our house suits us, too,and we would have to pay an awful lot more for a five-bedroomed house in the country, even in Lincolnshire. Our daughter, Lucy, attends a school within walking distance of home, my mother lives across the road and most of our local facilities are very close at hand. Within a stone's throw of our house we have a newsagents, our dentist, our vet (very handy for the 'boys'), an excellent fish and chip shop and a Chinese takeaway. 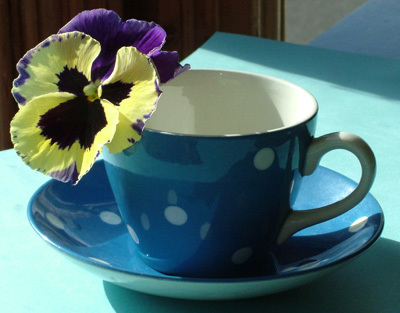 We are within a short walk of Tesco and the centre of town, with its twice-weekly market, a greengrocer selling local free-range eggs, the town library, our doctors and no less than five charity shops! My decision to shop locally, wherever possible, and to buy anything else online was confirmed last week when we travelled to Lincoln and spent the best part of two hours trying to find somewhere to park and travelling between the centre and the out-of-town stores we'd gone for. For a small town we are lucky to have our own Arts Centre, which shows films and hosts live performances, two swimming pools and leisure centres, a medieval manor house and four different allotment groups with plots to spare. I can be at my allotment just over five minutes after leaving my front door and in open countryside in ten minutes. Before moving here we lived in the country for eight years, six of them on a smallholding with hens and a flock of sheep. Although, in many ways, it provided an idyllic environment for our (then) young family there were also many drawbacks. For us they were the physical isolation, the time and cost spent travelling and, if you live in the Welsh uplands, the weather. At 600 feet above sea level on the slopes of Snowdonia, you could be enveloped by a dense mist for two or three days at a time and that was in the summer! I always found the word 'waterproof' to be a misnomer with regard to outer layers and the local weather. Persistent drizzle could find it's way through all of them and you just had to have a selection to choose from ; one to wear and one to drip itself dry in the outside loo! If you are reading this and you are hell-bent on moving to the country then this will not deter you - and so it shouldn't - but I always think any awareness of potential pitfalls helps you to be prepared, at least psychologically, should they have the misfortune to happen to you. I do miss the skippy little lambs, and even the lack of sleep that was the norm for us at this time of year but there are many skills that I first learned whilst living there, such as making preserves and being self reliant, that have stood me in good stead ever since. Others, like splitting logs with a nine pound axe, will be invaluable for feeding the woodburning stove we plan to install as a way of reducing our heating costs. I have often thought what an excellent tag-line Country Living magazine has: “WHEN YOUR HEART IS IN THE COUNTRY”. I think many readers like myself are not looking to physically move there but are looking for a simpler, more traditional lifestyle that living in the country is seen to embrace. When I'm on my allotment weeding the blackcurrants in the sunshine this afternoon I shall truly feel that in staying put I can have the best of both worlds! Once Christmas is out of the way I look forward to glimpsing the first Seville oranges in our local greengrocers.They are only in season for about a month and you either buy them then or go without until the following year. I bought quite a lot from there and then the fruit stall on the market was selling them at three pounds (weight) for one pound (money) so I bought another six pounds! Needless to say it has taken me until now to turn them all into marmalade. I use Delia Smith's recipe, which is available on her website ; I find it sets reliably using two pounds of fruit per batch. I don't actually like the taste of marmalade - though my husband and mother are big fans - but I really enjoy all the processes of making it. I find the repetition of squeezing and chopping strangely therapeutic and it warms my kitchen up a treat on the very cold afternoons we've been having until recently. 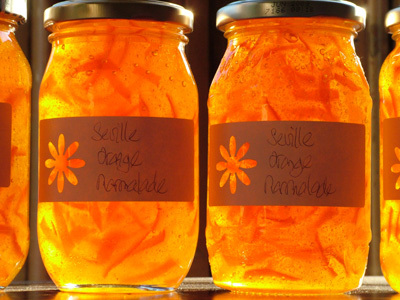 Although I don't like eating it I think the colour of the finished marmalade is beautiful. Looking at it reminds me of sunshine or the glow of a warm fire. When photographing the finished product I couldn't resist this close up shot of the light coming through this jar. 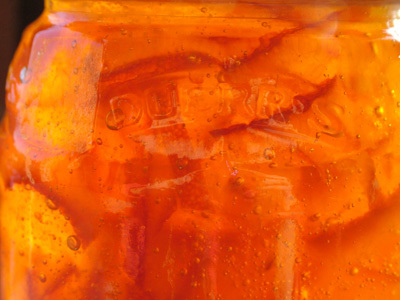 My family like thick cut marmalade best. I used to use a sharp knife to cut the peel into shreds but have found it more comfortable to use a sharp pair of kitchen scissors. Of course the advantage of doing it yourself is that you can cut the peel just as you like and you don't have to stick to Seville oranges, either. In How to be a Domestic Goddess, Nigella Lawson gives a recipe for Pink Grapefruit Marmalade, which I want to try next, and I have had great success with marmalade made from clementines with a measure of Cointreau added just before potting. Most of the latter was given away at Christmas as presents. If you start making a lot of jam and marmalade you will go through a lot of labels. They can be quite expensive to keep buying and I came up with the following idea after Zephyr, our lurcher, decided to eat the remainder of a box of labels from Lakeland that I'd carelessly left unsupervised on the kitchen table. I remembered that I'd got a box of plain white labels, the sort that have addresses printed on them to stick on envelopes, and I was just going to write on them as they were. However, in the same drawer as the labels was a paper punch in the shape of a dog's paw print. It seemed very apt that since it was the dog who had eaten the initial labels these labels should bear a doggy logo and I punched a dog paw at each end of the label. Even better, once they were stuck onto the jars the colour of the jar contents showed through and made my efforts look really professional. I haven't bought a pre-printed label since and have gone on to make lots of different punched designs. If the punch pattern is quite detailed you just have to be careful when peeling the backing paper off. I buy my labels from Wilkos but you should be able to find something similar from any stationers; I find the 9x3.5cm size ideal and I get a roll of 250 for less than a pound. I also find them much easier to remove from the jars afterwards than conventional labels. Last week was half term here and with my daughter, Lucy, having the week off we walked the dogs together, instead of the two separate walks I normally do on my own. This freed up some valuable extra time to embark on a round of card-making. The early part of the year is quiet for us in terms of birthdays and other family celebrations but following Valentine's Day they arrive thick and fast from late February and then gradually peter out towards the summer. Added to these, of course, are Mother's Day and Easter and as I hate doing things at the last minute - but invariably end up doing them then - I decided to start early. 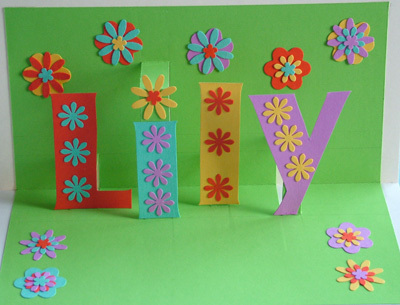 I ordered some books from our local library and had a practise go with this one for my niece, Lily. I quickly learned how crucial it is to get all the measurements correct before cutting the pop-up supports with the craft knife. It's not as if you can un-cut it afterwards and hope it will heal up again, unlike my self-healing cutting mat which I find invaluable. I also found it hard to get the letters to stay upright if I attached them with glue alone so I've bought some double-sided tape for future cards. Once I'd cut out the letters I had some small leftover bits of card from around the edges. I was going to add them to the compost bucket and then I remembered my paper punches. I use mine quite a lot (see next post) and I've picked them up from art and craft shops but also from branches of The Works and from our branch of Boyes, which has quite a big craft section, too. Punching the flowers out and then assembling them into different designs and colours was great fun and I stuck them together by applying the glue in little dots with a cocktail stick. Once it was all dry I made a loop of ribbon to fit round the card to hold it shut so it could go into a rigid cardboard envelope for posting. Having got to grips with this one I was inspired to make a Valentine's card for my better half. 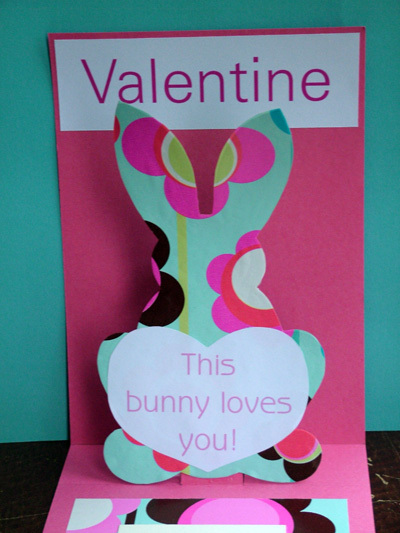 I traced the rabbit from a template in Petra Boase's Quick and Easy Handmade Cards and then cut out what I thought would be a big enough piece of card for it to 'pop up' from. It was only when I put the bits together and shut the card that I realised that the top of the rabbit's ears protruded from the top. Having cursed myself for my poor measuring skills once again I realised that it actually gave a tantalizing glimpse of what was inside! Both cards were well received, I had great fun making original creations and I probably saved myself a couple of pounds into the bargain. My third card, which I completed last week but have actually been working on for longer, also used a design from Petra Boase as a starting point. It's for some neighbours of ours who have just had their first baby. The original design had the baby's name stitched directly onto the felt but I'd just saved an article on monogrammed cross-stitch letters from an old magazine and so decide to cross stitch it onto Aida ( the woven cross-stitch fabric) instead. 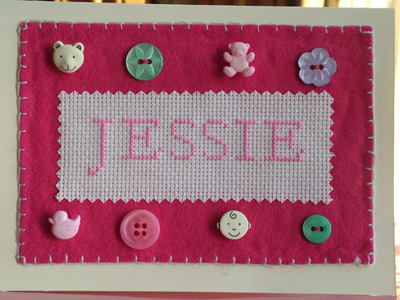 To ensure that the buttons stood out from the card I attached two strips of iron-on interlining to give a firmer backing than just the felt alone to stitch through. Petra Boase also gives instructions in the book for making a simple envelope. I made mine out of wrapping paper but I would probably use brown paper or something equally strong if I was sending it through the post. 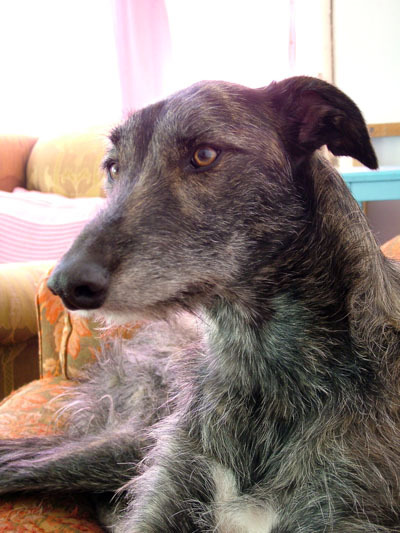 Here is Zephyr chilling in his favourite spot - the sofa - on a sunny Sunday morning.It's a popular myth that lurchers need loads of exercise but he likes nothing better after his morning walk than forty winks in a warm and comfy spot until tea time! Oh, and the odd biscuit after a bout of rough and tumble with his pal, Hector. This is Hector. 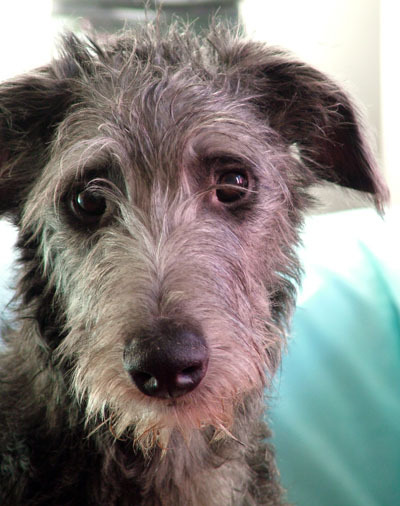 He is a six month old Deerhound puppy whose expression says that butter wouldn't melt in his mouth. Thankfully the butter is safe in the fridge but the very nice Hobbs scarf I bought from a charity shop for 50p on Saturday melted effortlessly into fine woolly shreds on the sitting room carpet!We are overlooking this departure from his usually charming behaviour on the grounds that Zephyr did so much worse on a regular basis at the same age. I was just considering their respective temperaments in terms of weather: Hector, whose general demeanour suggests sunshine in a cloudless blue sky and then Zephyr who, in meteorological terms, would be 'unsettled'. One moment you have the sunshine and the next a torrential downpour, triggered by nothing more complex than a plastic bag waving in the wind! As he grows up he is becoming calmer and we can detect steady progress towards high pressure! They do say, though, that opposites attract and these two are the very best of friends to each other, not to mention very dear companions to me. My day begins with a cup of Earl Grey tea and a snuggle with my two boys who need no encouragement to abandon their own beds in favour of mine! With hindsight, the signs were all there for anyone to see. Anyone, that is, except me. I had been running a secondary school library for seven and a half years and I had added to my role over time because, quite simply, I enjoyed the variety and the challenge. Over time, though, I began to feel that I was always behind at home, always chasing my tail, so that home wasn't a refuge to return to at the end of the day but a new set of tasks akin to the ones I had been tackling all day at work. Getting a dog was our attempt to step back and put our respective jobs into perspective, as just one aspect of our lives, but a puppy in the house quickly added to the problem as my dad was diagnosed in the autumn with a serious heart problem which would require major surgery. His condition worsened rapidly and at the beginning of December 2006 he was admitted to hospital. His operation, just before Christmas, was technically successful but the unthinkable happened and he died.I went back to work after about a month and gradually built up my hours to full time again but I couldn't seem to function properly. Anything that had to be done in a hurry brought on symptoms of panic and I went from confident multi-tasking to forgetting anything and everything which only added to my stress levels. In April the doctor signed me off work with depression and I asked to see a counsellor to help me come to terms with my dad's death. Together we explored this and other issues and I felt I was making progress but when I couldn't hack full-time hours again in September I realised that the bottom line was my job. I was still reluctant to accept this but my counsellor reminded me of a very important fact, that STRESS KILLS!That was really my wake up call and I wondered if it was all worth it. I had several long discussions with my husband, during which we did the sums and decided it wasn't. I handed in my notice at work. I have always enjoyed being creative for as far back in my life as I can remember. 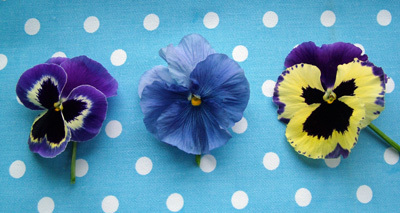 From spending my very first pocket money on felt to sew with, to learning to knit at university and on to baking cakes for my growing family it has always imbued me with a deep sense of calm and satisfaction. How apt then that, in electing to downshift, I shall be facing my greatest creative challenge - that of managing a family budget that has recently slimmed by a third. If you had told me two years ago that by the beginning of 2008 I would have given up a full time job to spend my days running our household with not one but TWO large dogs in tow, I would have considered you to be a few puppies short of a petshop! I would have added that I didn't particularly like dogs and that, anyway, I was far too busy to fit them into my busy schedule. It's funny then how life has a knack of turning all your pre-conceptions on their head. You think that you're heading in one direction (or just struggling to keep going, let alone thinking where you're headed) and you end up in a place which you had never envisaged but which turns out to be absolutely right for you at the time. You may even have taken steps unwittingly that have led you there. Books on downshifting seem to have crept onto my reading list as a follow-up to researching organic gardening methods for my allotment but it was never something I saw myself doing. The U-turn over having a dog is quite a long story but suffice to say that at 15 we felt our dog-mad daughter was old enough to help with caring for one and that it would be good for our stress levels to get out in the fresh air to give one a twice-daily walk. Like so many people, our ultimate incentive to change came from something we could never have imagined.